When requested by faculty, the Library will place items on Course Reserve at the Library Service Desk or electronically via a learning management system (e.g. Sakai, Canvas, Blue Docs) . To initiate a request, please complete our Reserves Request Form. If you are looking for particular items on reserve, please consult the Library for print reserves or the specific learning management system (Sakai, Canvas, Blue Docs) for electronic reserves. Books owned by the Medical Center Library & Archives can be placed on Reserve for in-house use at the Library’s Service Desk. 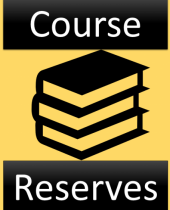 Instructors' personal copies of articles, audiovisuals, or books may also be placed on reserve. Materials from other Duke Libraries are not available for reserve at the Medical Center Library. The Library can also assist you in providing durable links to full-text articles from Duke-licensed e-journals, databases, and e-books. These links can be embedded into the course’s learning management system (Sakai, Canvas, Blue Docs, etc). Materials which are not owned by Duke will be subject to Copyright Governing Fair Use. Please call the Service Desk (919.660.1100) or contact Elizabeth Berney for assistance with reserve readings.